Some more new products added to my Etsy shop and online shop this week. 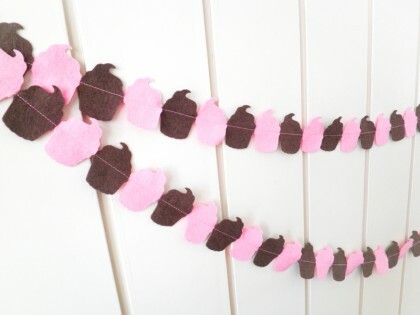 This adorable cupcake garland in pink and brown, I have been wanting to make this since I made a similar garland with circles for Courtney’s Kitchen, so when I found a die to cut out perfect cupcakes I was so excited! 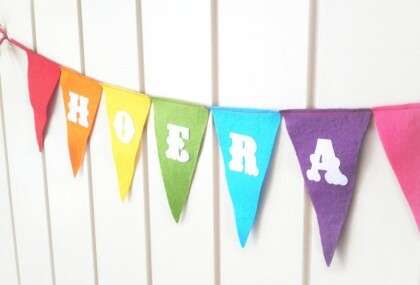 And I also finished this shorter (and so more budget friendly) HOERA flag bunting in rainbow colours. Good option for birthdays, but also other sorts of celebrations like passing exams etc. 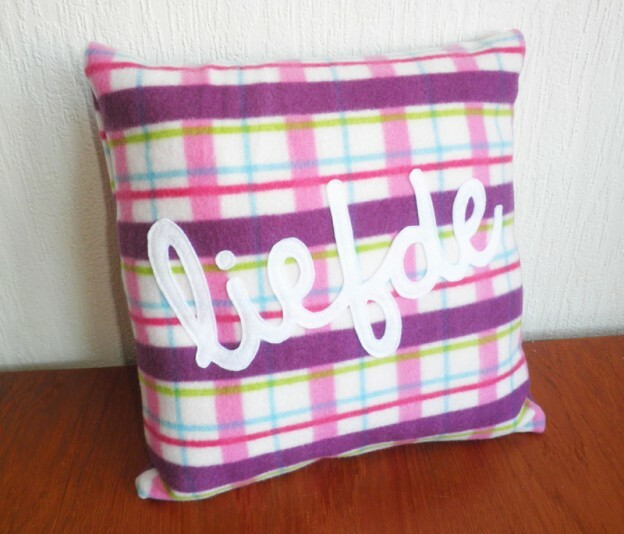 This entry was posted in Garland on July 30, 2014 by Handmade Cuddles. 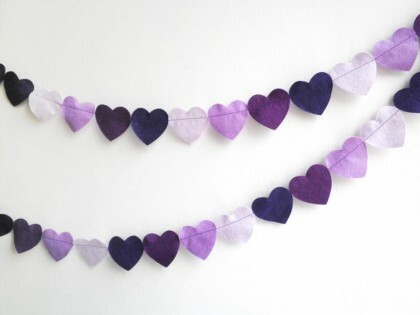 So earlier this week I shared some new felt heart confetti. I made this while cutting out lots of bigger hearts to make matching felt heart garlands. 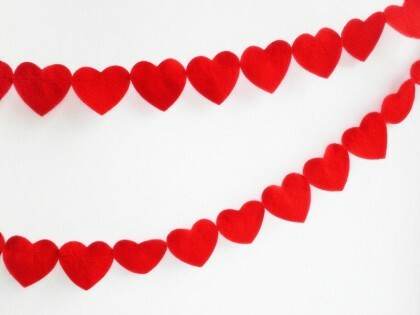 I have some more hearts cut out that just need to be sewn into garlands to add to my etsy shop too. 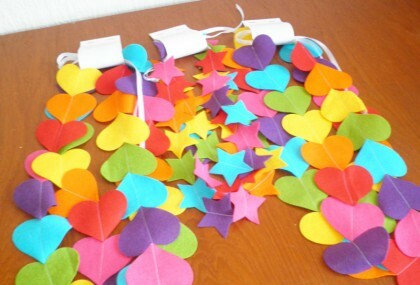 Gradually I will add lots of heart garlands, and also working on some other felt shape garlands too. This entry was posted in Felt, Felt Garland, Garland, Handmade Cuddles Creations, Valentines on May 3, 2014 by Handmade Cuddles. I work with felt a lot, for my garlands, cushions, decorations, seasonal products, properly about 80% of what I make has some felt on it somewhere. And while I love the feel of 100% wool felt, it is just not always a practical choice depending on the sewing project. I have made a few projects with 100% wool felt, it is very soft to work with, and lovely quality. But with that quality comes the price tag, so I only buy 100% wool felt for very special projects or gifts. The main type of felt that I use is a wool blend of 30% wool, 70% synthetic. You still get a very soft feeling felt, but with a reasonable price tag. I use this type of felt for all my garlands as it cuts really well in my sizzix machine and you can buy it in a whole rainbow of colours and shades. Then you have polyester felt, often considers the cheapest and lowest quality type of felt, but I actually thinkit gets too bad a rep sometimes. It is true you can go to craft shops and pick up some polyester felt for €0,40 a sheet, it is thin, will fuzz up quickly and stretch out of shape, but you can also buy better quality polyester felt too. For instance I buy my polyester felt from Jan Sikkes and it is lovely and thick, not as soft as wool blend felt but the real winner for me is that it washes great! No shrinkage, no wrinkles, no fuzz etc. I use this polyester felt on all my fleece cushion covers. So those are the main types of felt, which one you use really depends on the project and how much you want to spend! Coming up later this week, how to cut delicate shapes out from felt easily. This entry was posted in Felt Garland, Garland, Handmade Cuddles Creations on January 13, 2014 by Handmade Cuddles. Last week I showed you the bag my friend made with my help, well she had another request for us to work on, a tooth clock. 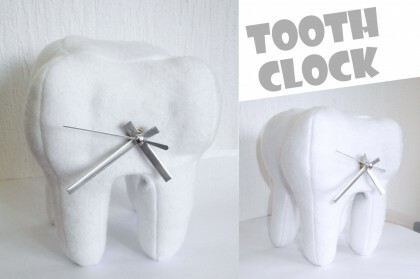 What is a tooth clock? Well its just that, a clock that is shaped like a tooth. So I prepared the pattern (which took at least 10 testers before we were happy with it) and then using that pattern we sewed up the 3D tooth plush together, and then added the clock motor inside it. I loved how it came out, it was very much a trial and error process as I struggled to find any examples of 3d plush teeth. In the future I may release this pattern to sew a 3d tooth plush, but properly not till next year. This entry was posted in Custom Orders on September 16, 2013 by Handmade Cuddles.